Pupils in Shirebrook have taken up their cameras as part of a photography competition designed to provide artwork for their new £27m school building. The art and design students at Shirebrook Academy, in Common Lane, were set the task of creating images which are good enough to grace the building, which will replace the school's current base when it opens its doors in April. The competition is one of a series of initiatives designed to give pupils a sense of ownership of the new school, which has also seen students and staff work with architects on the lay-out, colour scheme and furniture, while pupils are also helping to write a new school song. Based on a theme of Close-Ups and forming part of the Year 11 pupils' GCSE coursework, the photography competition asked students to take shots around the school's site that they felt best summed up the old and new buildings, or reflect their feelings about their immediate environment. There were a wealth of entries and the eventual winner was Bridie Shorthose, (left) who received gift vouchers and will get to see her photo blown up onto a large canvas and given pride of place in Principal Julie Bloor's new office. Nine other winners will see their photos hung in other offices across the new building. Bridie said: "The photo was about remembering the past as you turn your back on it and I'm pleased that people like it and have understood what it was about. 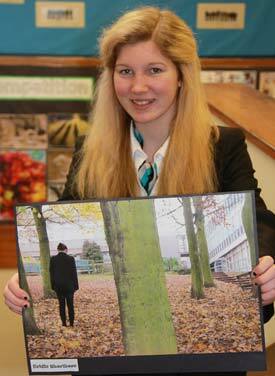 "Now I'm really looking forward to a new start in a new school and seeing my photography up in Mrs Bloor's office." Mrs Bloor said: "Bridie's photo is beautiful and sums up the move perfectly, which is why I chose it as the winner. "It reflects that the school is moving forward, but reminds us to keep in mind where we have come from. "It's extremely pleasing to see our students engaging with the ideas that are being put forward to help them feel at home in the new building. "The move into the new school is almost upon us and by now nobody at the school is in any doubt as to how significant that move is, both for the Academy and for Shirebrook itself." Shirebrook Academy, which will share the building with Stubbin Wood School, is set to move in when pupils return after the Easter break. Among the new building's facilities are specialist technology areas, science labs, IT, drama and music rooms, a 3D cinema, a sports hall and a 3G all-weather pitch.